So, we had another productive staff meeting at work yesterday. Last week, we discussed my plans to rebuild society after the nukes fall at the Ikea. This week, we discussed parenting. I had to reveal my big parenting plan. Kids pick up on what is around them. They use the words they hear. That is their reality and all they know. So, I figure I will save myself a lot of trouble if I carefully plan the words I use. For instance, I will always call any candy, broccoli. And broccoli will be candy. That way, when they get to school and people offer them candy and such, they will be like, "Heck. No." This plan should work perfectly with other things I wnat them to stay away from, like making out, drugs, and Pauley Shore. Dang, I should write a parenting book. Also in that meeting, Doug F and I hit onto a new TV show idea: Pirate Dad. It began as a Father Knows Best kind of thing with Dad in an eye patch and a hook for a hand. He'd always warn about scurvy. And pat Johnny on the head and tell him to go help his mom swab the deck. It'd be a good family show. But as we discussed we thought that it would be better to be a Full House kind of thing with three pirates raising kids. Cookie would be the pirate who'd make dinner and stuff. The Captain would be the actual father figure. The best part is that we thought they could all sleep on hammocks tacked to one wall in the house. It'd be great. "My show ain't no Dr. Phil, with people sitting around crying. You're a fool--that's what's wrong with you. You're a fool if you don't take my advice." 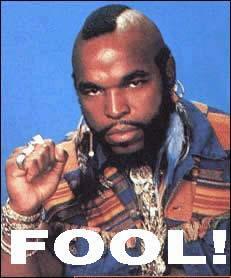 --Mr. T talking about his new TV talk show. "Brides will be taken, but they won't help your chances any." --A Freudian slip by me in a list of rules for my work's Salsa contest. It was meant to be "bribes." "I don't have a choice. It's not like I can go do construction, start building houses in Malibu. [The Media] are forcing me to do this, and I'm glad they are. I'm more than happy to do it. I categorize myself as an artist--a true artist." --Kevin Federline's crazy rationalization on why he is making a rap album. As a reflection of the sad state of primetime network programming, you're idea is likely a sure-fire hit. Might I recommend expanding the franchise? Pirate Dad: Special Victims Unit? Pirate Dad Miami? Perhaps, a puppet-based series featuring ALF?